Since it is Cinco De Mayo on Saturday I thought it was only appropriate to share a Mexican themed recipe today! We made these tacos last week and they were delicious. But lets be honest I love any fish tacos! We baked our fish in the oven instead of grilling and it turned out flaky and perfect. I used Cod for our tacos but you could easily substitute Mahi, Tialapa or any white fish that is in season that your grocery store has. We served ours with a side of black beans and rice. Add some some ritas and tequila and you have yourself a sweet Mexican fiesta! Btw sorry for the lack of pictures. By the time our tacos were done it was pushing 9:00 and I was too darn hungry to stop and take photos before I demolished my tacos! 1.Light a grill. In a medium bowl, mash the avocados, sour cream, jalapeño, red onion, cilantro and 3 tablespoons of the lime juice. Season the guacamole with salt and pepper and press a piece of plastic wrap directly onto the surface of the guacamole. 2.In a large bowl, toss the cabbage with the 2 tablespoons of vegetable oil and the remaining 2 tablespoons of lime juice. Season with salt and pepper. 3.Brush the fish with oil and season with salt and pepper. Grill over moderately high heat until lightly charred and cooked through, about 10 minutes. Transfer the fish to a platter and pull off the skin. 4.To assemble each taco, spread a dollop of guacamole on a tortilla. Top with a piece of fish, a few tomato slices and a large spoonful of the cabbage slaw. Serve with the hot sauce and lime wedges. On Wednesdays, you SLAY me! Completely slay me! These look amazing. Maybe making an appearance on Cinco?!?! I think so! Yes ma'am. I will be putting these on rotation in my new meal planner! These look amazing- we love fish tacos, living at the beach. If you haven't had them before it is hard to understand how delish they are! YUM! This is definitely going to happen in my kitchen, thanks for sharing! You are my go to for dinner recipes! Yumm! You always have the best recipes! This recipe has my name written all over it.....VAL, make me!!!!! I think I am going to have to make these for dinner tonight. You had me at guacamole! I love fish tacos! I wish I could come to your house for dinner! MM these look delicious! Love the idea of lime guac! Yum! You know I'll be adding these to my list of meals to try!!! 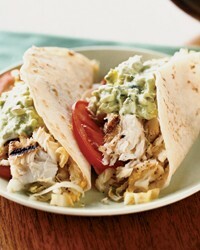 Looks delish..I love fish tacos!